Gumbo, a rich Creole stew containing okra, onions, green peppers, tomatoes, roux -- a cooked mixture of flour and fat -- and seafood as well as sausage or other type of meat, serves as a hearty meal on a cold day. 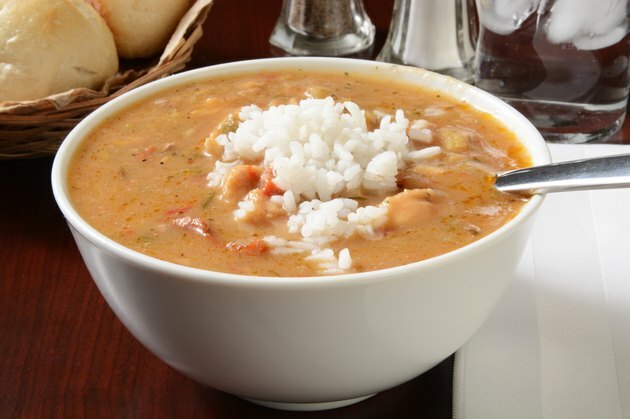 The calories in gumbo may contribute to your daily nutritional goals. One serving of approximately 1 cup of gumbo contains 320 to 450 calories. The calories will vary depending on the types of meat and seafood included in the stew as well as the vegetables used. Based on a 2,000-calorie diet, the number of calories in gumbo equals 16 to 22.5 percent of what you may consume in a day. Many of the calories in gumbo come from protein; the Institute of Medicine recommends ingesting 46 to 56 g of this nutrient per day. A serving of gumbo contains 28 to 37 g of protein. One serving also provides you with 13 to 21 g of carbohydrates. You should consume 130 g of carbohydrates to meet your energy needs every day, also according to the Institute of Medicine. All recommendations are based on a 2,000-calorie diet. Gumbo often contains high amounts of fat -- one serving of gumbo generally has 17 to 27 g. MayoClinic.com recommends limiting fat to 44 to 78 g per day to avoid obesity and health problems associated with being overweight.